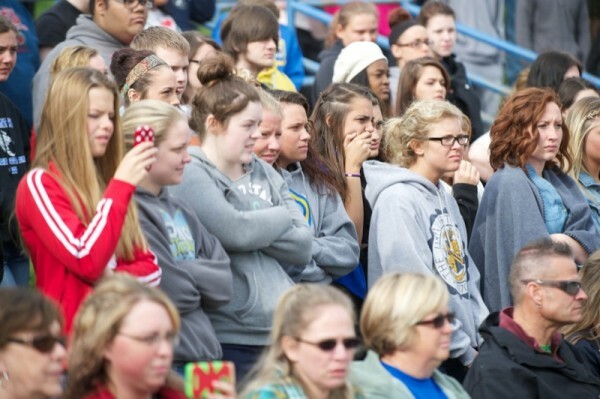 About 800 Coventry High School students quietly watched the drama unfold. It’s the season for proms, grad parties and year-end celebrations. High school students hear again and again about the dangers of drinking and driving, but it’s a different thing to see it, hear it, and feel it. On the morning of May 5, about 800 students at Coventry High School stood on a hillside and watched a dramatization play out in front of them. With a bang and flash, tarps were removed to reveal a bloody crash scene. A Jeep and sedan were mangled together. The driver of the sedan had been ejected and was sprawled on the hood of the Jeep. The dramatization was timed before the start of the year-end prom and grad party season. The crowd’s silence was pierced by moans from the survivors inside the cars. Within minutes, they heard sirens. 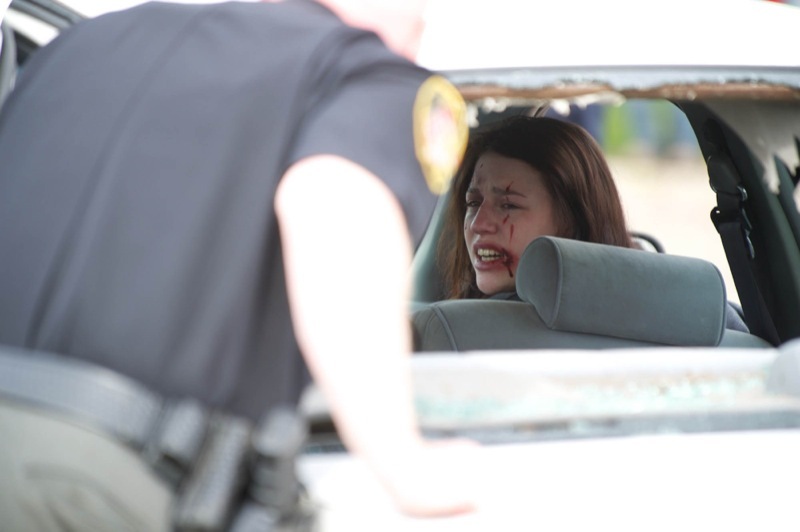 The mock trauma was staged by the Summit County Sheriff’s Office, and similar events have been held at other high schools the previous 2 years. In addition to the Sheriff’s Office, the Summit County Prosecutor’s Office, the Juvenile Court, Coventry Fire and Rescue, Akron Children’s Hospital, Fox 8 TV, and State Farm Insurance helped with planning and/or sponsorship. The 5 students selected to be “actors” in the drama are seniors who are well liked and respected by their peers, said Cottle. A deputy told the driver of the Jeep to exit the car. When empty beer cans tumbled out, the 18 year old had to take a field sobriety test, which he failed. He was handcuffed and taken to Summit County’s Juvenile Detention Center. The sense of realism in the dramatization was heightened by the use of make-up to resemble wounds. Two of the students were treated by paramedics on the scene and released to their parents. The fifth student, pulled from the sedan, had the most severe injuries and was taken by ambulance to Akron Children’s ER. The victim was played by Hailey Harris, complete with make-up resembling realistic facial wounds. Janice Nadeau, a media center specialist at Coventry High, said the lesson will continue the next morning when all the students are called to an assembly. They will see a TV news report of the accident, video of Hailey being treated at the hospital and their other classmate being arraigned on charges of driving under the influence and vehicular homicide. Many thanks to Akron Children’s Hospital and your staff for all of your support with this event. It was a HUGE success! Couldn’t have done it without you!